He’s a minor figure in the Old Testament, and an ancient civilization, too. 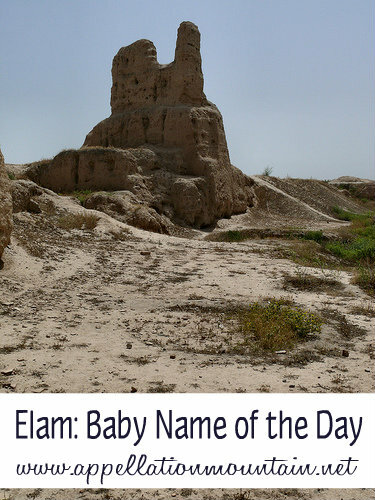 Thanks to Holly for suggesting Elam as our Baby Name of the Day. Biblical names are huge. Today’s nursery school rosters read like the guest list for the wedding at Cana: Jacob, Noah, Daniel, Elijah, Benjamin, Joseph, Samuel, Caleb, Isaac, Isaiah, Luke. But Elam isn’t among them. He’s been in the US Top 1000 before, but his last appearance was all the way back in 1898. Elam hibernated for most of the twentieth century, but he’s trended gently upward in the last decade or so. Doubtless that’s due to so many parents seeking out wearable rarities to replace our current favorites. 55 boys received the name in 2011. 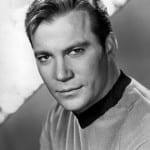 His pronunciation – EE lum – reminds me of Liam, with the sounds reversed. Given the white hot popularity of Liam, it is easy to imagine Elam fitting right in – or forever being confused for the Irish appellation. So who was the original Elam? 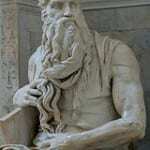 In the Book of Genesis, he’s the son of Shem, the grandson of Noah. 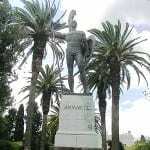 Some linked the city’s name – Susa – to the name of Elam’s son or daughter, Susan. But it seems more likely to be derived from the name of an Elamite god, Inshushinak. You can still visit a ziggurat built around 1250 BC to honor Inshushinak, built by the Elamites. Ancient places echo in plenty of our children’s names: think of Madeline (Magdala) or Laurence (Laurentium). And place names are terribly current today. 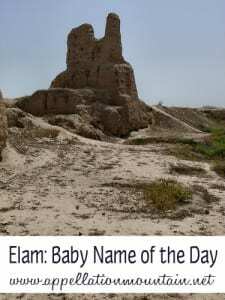 There’s also some history of Elam’s use as a given name, which makes him less of a daring choice than, say, Egypt. It’s possible some of the Elams were wearing a family surname. There were two places in Kent called Elham, which sometimes led to the last name Elam. There’s no link to the ancient world here. Instead, ham refers to a homestead or enclosure, and appears in many a place name. The el part is difficult to pin down; it was actually spelled Alham in the Domesday book, and other versions were recorded, too. Others are clearly inspired by the Biblical figure. Elam Luddington, Jr. is considered a Mormon pioneer, the first missionary from the Church of Jesus Christ of Latter Day Saints to preach in Thailand. Luddington was an adult convert to the faith – he was born some years before Joseph Smith, Jr.’s visions established the new church. The name Elam stretched back at least four generations in his family. The Luddington family tree is packed with quirky Old Testament names: Aseneth, Eliphalet, Mehitable. There were other uses in the nineteenth century. Elam Vangilder played baseball in the 1920s. Overall, Elam is a true rarity with deep roots and a modern sound. If you’re disappointed that everyone is using Elijah, this might be one to consider. Then again, I am thinking Egypt is a fantastic idea. But I can’t decide if I like it more for a girl or a boy. In the Bible Egypt is named after a queen named Egyptus, right? sometime after the flood, or was she one of the women on the ark, who married Ham (now THERE’S a name to discuss at the dinner table).